A ComfortDelgro taxi passes Uber and Grab offices in Singapore, March 26, 2018. 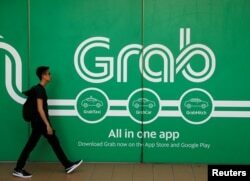 Uber Technologies has agreed to sell its Southeast Asian business to bigger regional rival Grab, the ride-hailing firms said on Monday, marking the U.S. company's second retreat from an Asian market. A man walks past a Grab office in Singapore, March 26, 2018. FILE- Ousted Uber CEO Travis Kalanick leaves federal court in San Francisco, Feb. 7, 2018. Uber includes the United States, Australia, New Zealand and Latin America among its core markets — regions where it has more than 50 percent market share and is profitable or sees a path to profitability.